There’s nothing worse than nodding off in the car with your face wedged uncomfortably against the support pillar or jerking yourself awake constantly on the airplane as your head falls forward, only to wake up with a sore neck an hour later. Thankfully travel pillows are a big business now and not only can you skip the discomfort of sleeping with your chin on your chest but you can find a pillow for every posture and need. There’s a comfy pillow made of fleece, memory foam, beads, or other material for your neck, back, and even tailbone. After comparing pillows for different types of travelers and needs, here’s our travel-friendly picks for wherever your journey takes you. There are a lot of crazy travel pillows on the market these days, but if you want a more traditional travel pillow the BCOZZY offers comfort without straps, buckles, or a sci-fi vibe. It looks like a U-shaped pillow—but with a twist. 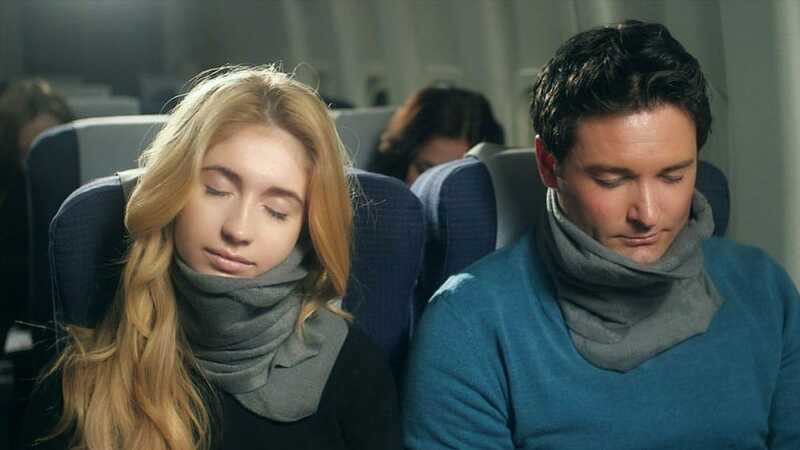 Not only does it wrap around the back of your neck like a traditional travel pillow but you can adjust the arms for comfort whether your head is leaning back, forward, to the side, or even against the window. With this 360 degree strategic cushioning, it takes care of the head, neck, and chin to completely eliminate head bobbing. This pillow snaps to luggage so it’s easy to carry and it’s also machine washable, so you can to wash out that drool with ease. — Buy it now. 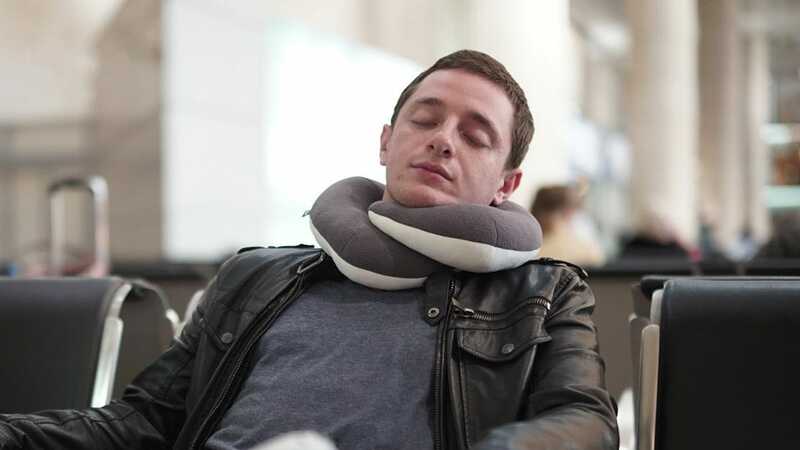 If you want all the support of a traditional neck pillow but none of the “I’m wearing a cervical collar” look, the Trtl neck pillow is for you. It’s so low profile and understated that you could probably wear it right off the plane without getting an odd look. The Trtl looks like a scarf wrapped snug around your neck. Inside of this scarf-looking design is a hidden internal support system with strong but flexible ribbing that cradles your neck whether you’re leaning your head forward or to the side. 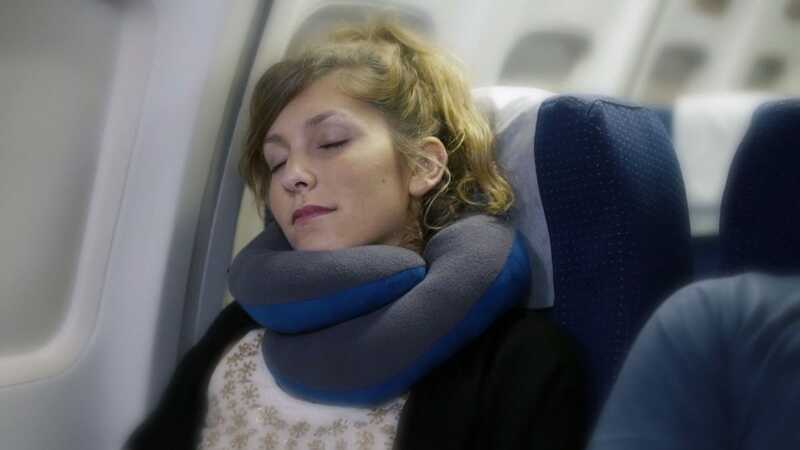 If the Trtl design strikes you as particularly clever then it should come as no surprise that it was designed by two mechanical engineers in search of a better travel pillow. The Trtl is easy to fold up when you’re done napping and is half the weight and size of a traditional memory foam travel pillow. The soft fleece is also machine washable and, thanks to the lack of bulky foam inside, quick drying. — Buy it now. If you remember the giant inflatable seat-tray table that appeared in the in-flight catalog Sky Mall for all those years, you’ll recognize the HomeCube travel pillow as its descendant. If you struggle to sleep while sitting completely upright, this pillow is perfect alternative to neck-only designs as it allows for three different positions where you hug the pillow: resting your chin on the tall side, turning it around and resting your face in the cutout hole, and squeezing it between your arms to use it as a side pillow. It might take up a bit of lap space, but you’ll get all the support and firm pressure against your body you need for a good nap. Thankfully it’s inflatable so you can easily stash it when getting on and off the plane. Despite the inflatable aspect, the outside of the plastic is covered in PVC flocking (like you find on many inflatable beds) so your face and arms won’t stick uncomfortably to it. — Buy it now. Now hear us out. The Ostrich might look ridiculous, but there’s a method to the madness. For people who are willing to sacrifice anything in the pursuit of a deep and restful sleep on the road, it’s a tiny sleep haven you can shove your head right into. 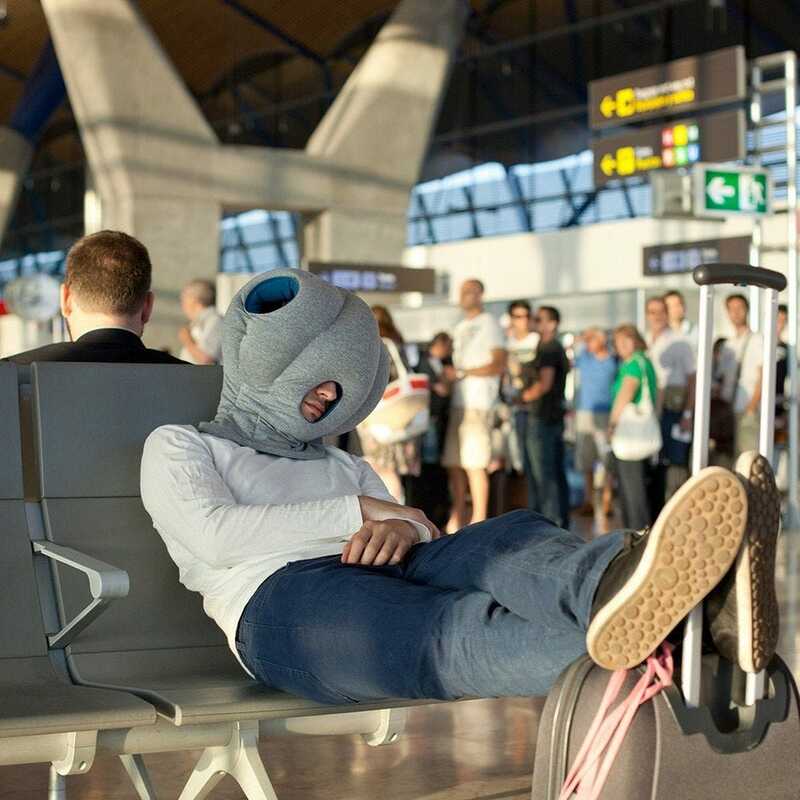 Whether you’re trying to sleep between layover flights or in the passenger seat of a car, the Ostrich covers your eyes, supports your neck and head, and has cushions on all sides—allowing you to rest against anything comfortably (except maybe the passenger next to you). The design features an opening for ease of breathing as well as hand holes (for when you’re sleeping with your head down and want that cozy hand-to-cheek napping style). The body of the pillow is a soft fabric packed with microbeads that adjust to the pressure of your body. The company bills it as a “little private space within a public one” and if you’re willing to stomach the high price and strange looks (even the people in the background of the promotional photo above are looking at the thing with puzzled expressions), it’s the closest thing to a Japanese pod hotel you can bring on a plane. — Buy it now. 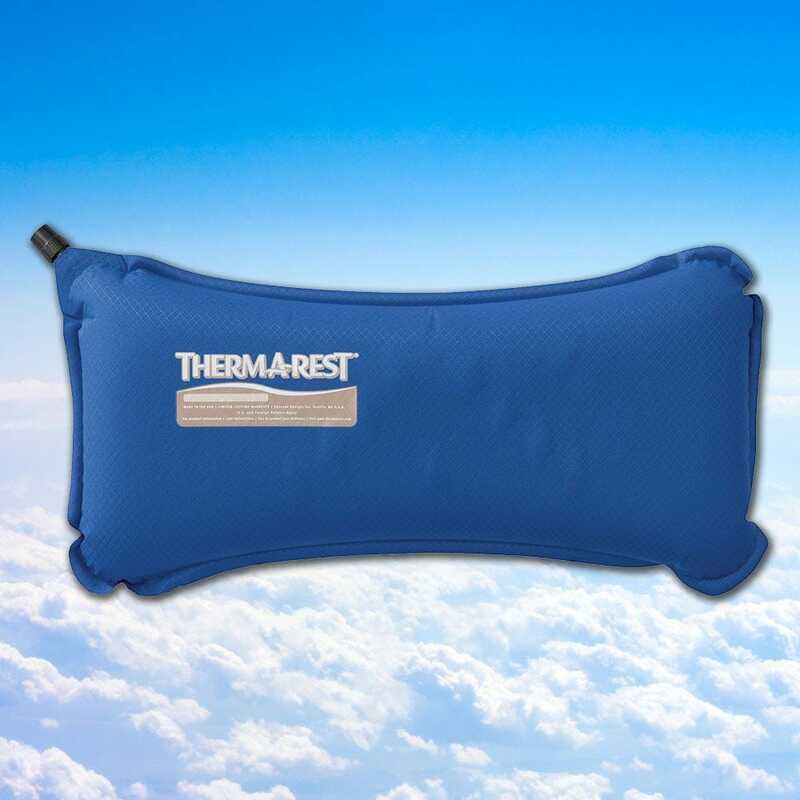 If your biggest travel complaint isn’t your nap-kinked neck but back pain thanks to the lack of good lumbar support in airplane seats, the Therm-a-Rest lumbar pillow is potentially more vital to your travel arsenal than a neck pillow. The compact pillow packs small, self inflates (and can be over inflated up to two inches thick) and is just the right size to tuck in the small of your back and provide firm lumbar support for the duration of your flight or road trip. When the trip is over, just pop the valve, roll it up, and pack it away for the next leg of your journey. — Buy it now. For those of you that find long stints in your seat agony on account of compression on your thighs or tailbone, don’t worry, we feel your pain—which is why we rounded out the bottom of our list with this comfy pillow. 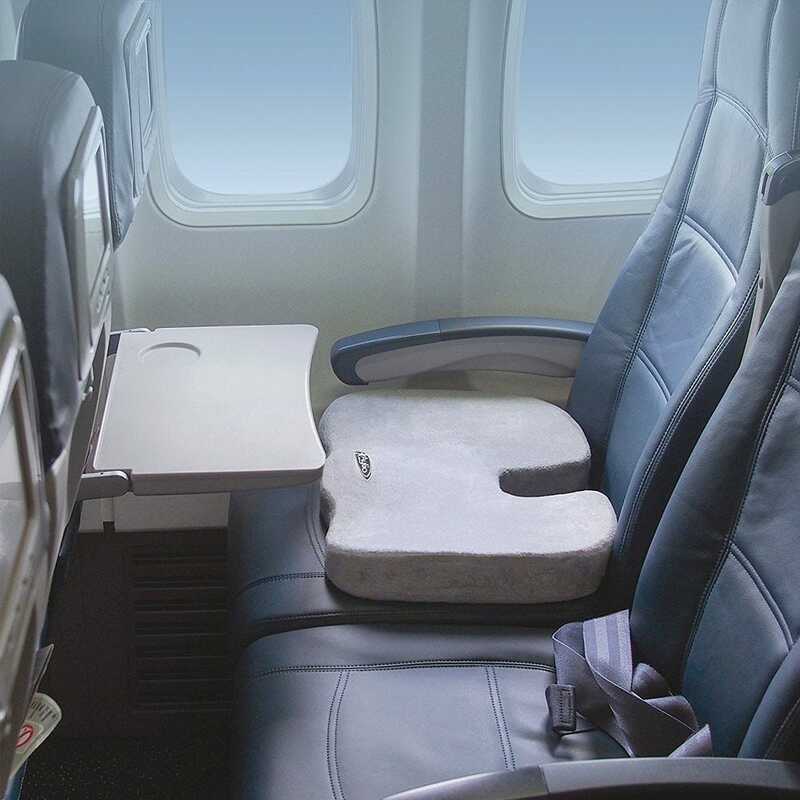 The Aylio Coccyx Seat Cushion is the kind of travel pillow most people think of when shopping for one, but it’s just as important as a good neck pillow for pain prevention (just on the opposite of the body). This pillow takes the pressure off of your spine, which is perfect for coccyx, Sciatica, and back pain—and the extra dense memory foam keeps your tailbone and spine elevated even as the trip drags on. 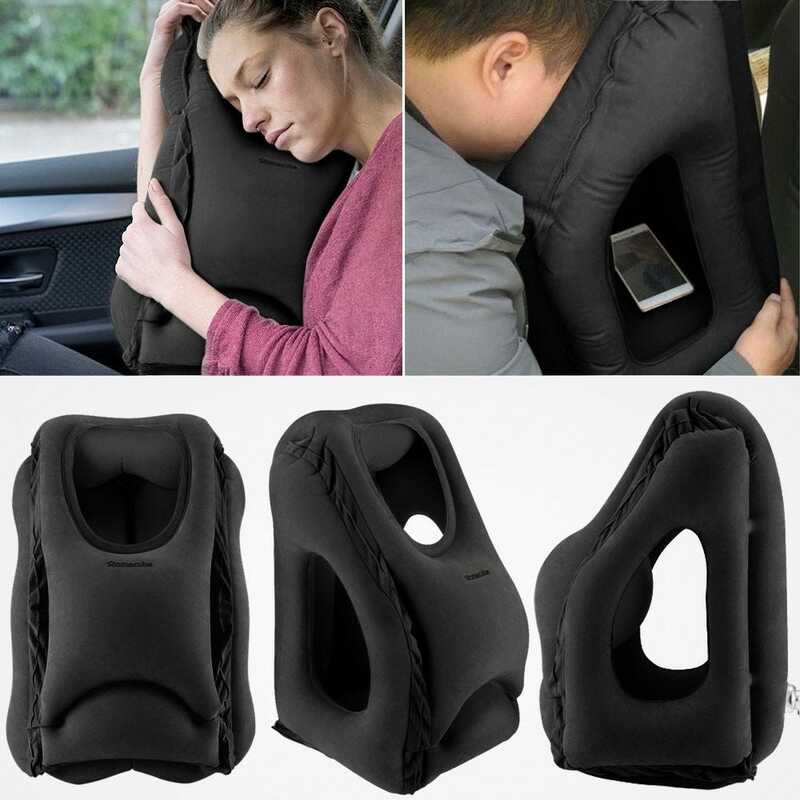 It sports a machine washable cover and, unlike, many travel pillows, you can get more mileage out of this pillow by using in your car, at your desk, or anywhere you need to relieve pressure on a painful tailbone. — Buy it now.